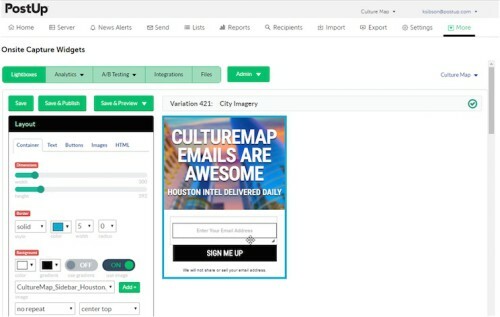 UnsubCentral, a PostUp company, announced the launch of Opt-in Central, a leadgeneration and list growth tool to capture email contact, behavioral and demographic information of site visitors. The tool’s capture widgets have a data feed that can connect with any Email Marketing Software. They collect geographic and demographic data through a reverse IP lookup. Capture and paywalls are offered as a service. They integrate with PostUp, or with other ESPs, or as a stand alone service and product. automated append of demographic and geographic data. 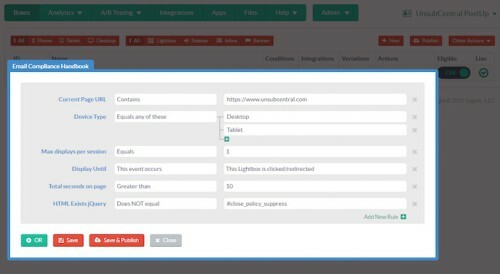 Rules in its backend allow for further sophistication in targeting. 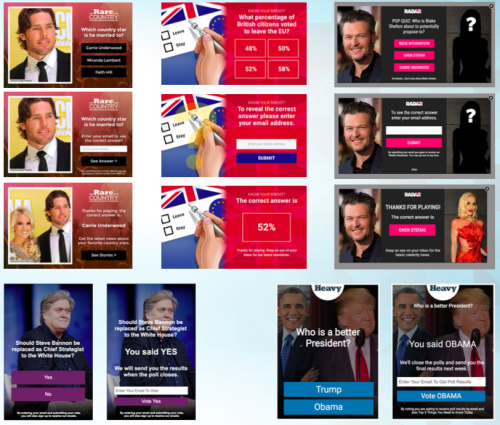 Widgets include sliders, takeovers, mobile one click, polls, quizzes, sweepstakes, share with a friend, paywalls, and guest passes. Additionally, PostUp swears by the intelligent features such as dynamic optimization of user experience based on traffic source, as different sources show different behaviors. As per Patrick Asbra their new tool can recognize visitors that signal annoyance and backing off, or users at different stages of conversion, therefore, presenting the right offer to customers. E.g. 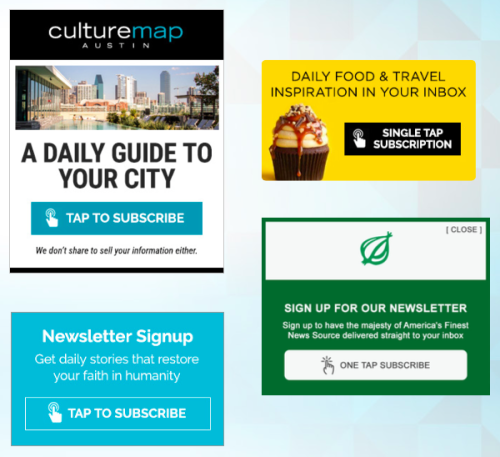 serving up a free trial or progressive capture widgets to convert a free trial to a paid trial. Editing of the onsite capture widget with a side-by-side preview. Here we see the addition and editing of display and targeting rules. The new addition of Opt-in Central, has them going against some of the bigger list growth widget bakers. That market is booming. 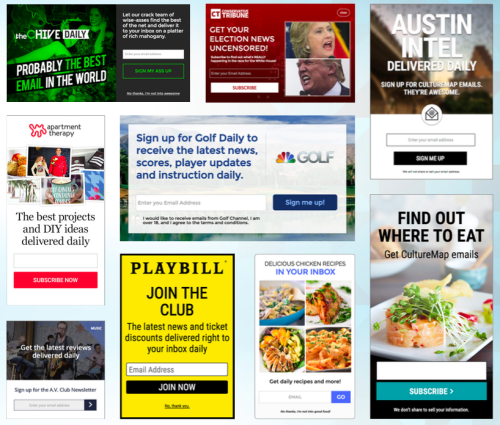 Marketers can now grow their email lists and grab more customer data through on-site capture widgets. The new tool is mostly targeted to media, publishing, affiliate publishers, but the widgets can be used in other industries as well. Patrick Asbra from PostUp Unsubcentral told us they see, for instance, Opt-in Monster on the low end and Bounce Exchange on the high end as their competitors. They are planning to beat them with machine learning “smart capture” widgets with business rules, flexible animation, progressive capture, and one click mobile subscribe. They also have a services and strategy team that helps set-up the system. Originally the PostUp / UnsubCentral combo offered opt-out list management for companies to be email compliant even when the opt-out process is complex. PostUp & UnsubCentral is already certified under the EU-U.S. Privacy Shield Framework. Data is encrypted in transit and at rest, and their capture widgets and email solution affords support for a variety of international compliance situations such as affirmative opt-in and double email opt-in. They ensured us, that this makes it possible to use and legally meet the requirements of the GDPR. Opt-In Central’s lead and list generation tools are not cheap, starting at $1,500 per month. PostUp offers packaged pricing for existing PostUp and Unsubcentral clients. The online capture widgets and service packages are already “live” and available. Opt-In Central technology is not developed in-house but is a white-labeled solution, services offered by company’s in-house strategic team.